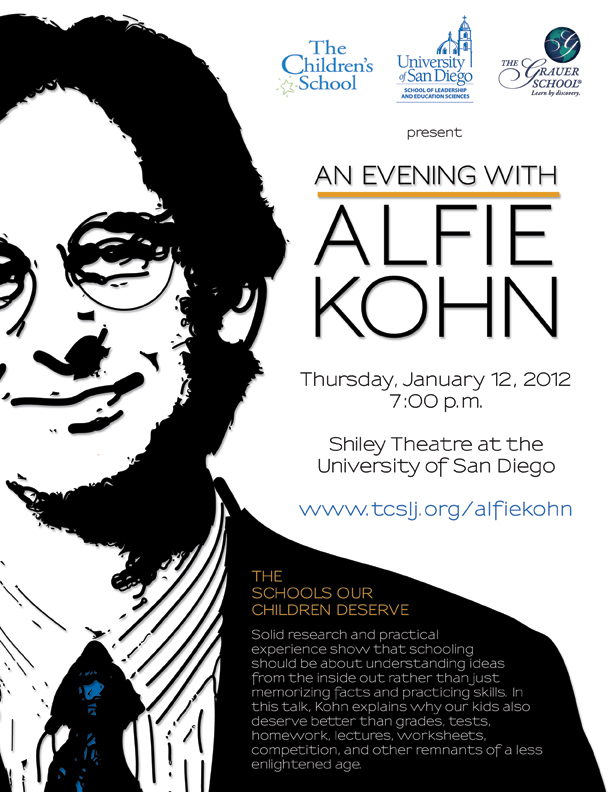 Alfie Kohn came to USD last January to talk about what it means to be truly well educated. What does it mean to be well educated? My first experience with Alfie Kohn's simple yet complex question was last spring when he came as a guest speaker to the University of San Diego. At that time, my research fellowship required me to organize and plan for the Department of Learning and Teachings special events. My faculty advisor gushed about Kohn and made it clear to me that he was one of the biggest and most important names in the field of education today. After plenty of research and extensive readings, I found myself fascinated with his work and agree that he is one of the most knowledgeable and approachable writer and speaker in the field. Taking a look at his article titled "What does it mean to be well educated" (2003) answers many questions about education in a clear and precise manner. 1. Kohn's wife- After 29 years of schooling not including medical residency, Kohn's wife still cannot do basic arithmetic or use good grammar. Yet, what she is lacking is not preventing her from her professional success. Kohn's wife is a great example of the question of whether or not our schooling is flawed. If someone can go through such extensive schooling and still have trouble with the basics does that mean we have failed as educators? I believe the answer to this question is no and Kohn follows up by providing many great examples. 2. smart or book smart?- Kohn states that he has realized how many truly brilliant people cannot spell or punctuate. Does this diminish their value as a professional? Absolutely not. I agree with Kohn when he says that their insights and discoveries change the shape of their fields. Who cares if they can't use an apostrophe correctly to save their lives? As a journalist and writer myself, I admit that I am not the best at grammar. Every great writer still has an editor that focuses in on the minute mistakes that harm our writing but not our ideas. As an ESL teacher, I am still reluctant to say that I know all of the rules of grammar even though I teach many grammar points on a daily basis. Yes, I know more than most of my peers about grammar terminology, but that is just because of using it on a daily basis not because I'm smart. Of course knowing the foundations of any subject will help you to succeed, however if you still have the will to learn and challenge yourself every day towards learning something new you are on the pathway towards being well educated. We can pick up a dictionary and check our spelling and use a calculator to correct our math. Does that mean that we are dumb or just using our minds to focus on more meaningful things than the basics? 3. What is well educated?- How many times have you encountered someone that you think is smart because they know alot of names, ideas, and facts about a particular topic? In my personal history in life this person was an ex boyfriend. We would often talk together about his ability to recall a ton of random information and today I still wish I could recall names and cool facts like he can. Yet, he stated to me that I was smarter because I could talk in depth about the few topics I knew and could write about them better than he could. So who is smarter? One of my favorite quotes from Kohn's article on this topic states that familiarity with a list of words, names, books, and ideas is a uniquely poor way to judge who is well-educated. He says "to be well educated then is to have the desire as well as the means to make sure that learning never ends." We have to have the desire to keep learning in any context and to have the means or ability to do so. Thus in my opinion someone that is not well educated doesn't care or take the time to learn themselves or they do not know about or have access to resources that would make learning possible. With the internet I find it hard to believe that people in my generation don't know how to take control of their own learning and I believe they are easily distracted by the plethora of information available to them. This article has brought me back to my latest post about whether or not getting a Master's of in Education in TESOL is worth the effort in our failing economy. To work at in the university setting I am required to have a Master's degree, however I strongly feel that the reason I have developed good skills as a teacher is because of my past work experience and observations of teachers in the field. My jobs in Korea and Japan are what have allowed me to make the connections and skills I have today. My future diploma has contributed to much of my background knowledge in the field and will allow me to begin applying to higher end jobs. But just because I have a Master's degree does not make me well educated. The program and many life experiences have inspired and equipped me to continue learning which is what makes me "well educated."